Two weeks before the Holy Week, I was already thinking where to go. I definitely don’t want to stay home. The culture in the Philippines during holy week is going to the Church. Though far from my family, I still can stay at home watching TV the whole day but I know it will bore me to death. So, I decided to go out somewhere far from the stressful life of Singapore. I choose Bintan over Batam because of the nice beaches. I searched hotels in Bintan but all are fully-booked. Since the hotels are fully booked, I searched for a cottages or “pondok” (it’s what they called in Indonesia). I found some but the reviews in trip-advisor backed me out. I didn’t lose hope. One “pondok” style came out of the website and it arouses my interest because of a good review. I emailed Mutiara Beach Guesthouse to reserve a cottage for 3 days. Marc Thalmann, a Swiss owner was so fast upon replying my message that the guesthouse was fully booked during my required days. I then asked if they accept campers and he said yes. I only need to pay SGD8++ with free breakfast, towel usage & access to the bathroom. He also suggested to book a taxi via Indorent as they don’t have a transportation going to their guesthouse. He also told me that if I don’t want to book to Indorent, I might be lucky if I can find a cheaper taxi. Taxi will be SGD65 for roundtrip. Fair enough, I told myself. Now, hotel is settled, nope, camping place is settled and it excites me more. My next step will be buying a tent & a ferry ticket. By the way, I asked Mr. Thalmann if it always rains in Trikora (the location of Mutiara is a stretch of Trikora Beach) and he said everyday is summer. I checked Bintan Resort Ferry & it will costs me SGD90 for roundtrip. I didn’t booked yet, I have to find another way to book cheaper than their price. I found holiday city’s website, check it out, www.holidaycity.com. I clicked it and tried to book and the price? Only SGD72! I saved SGD23! Fair enough? Yes! It’s a good savings. I booked it immediately and now my next mission is to find a tent. 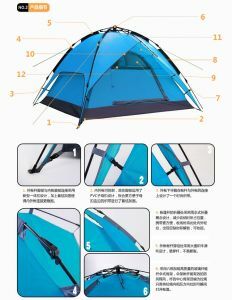 I searched and even asked to my local friends where can I buy a tent and the internet and my colleagues has the same answer, go to “Beach Road”. I went there after office, the 3rd floor of the Hawker Center. There’s a lot of small stalls selling military accessories. 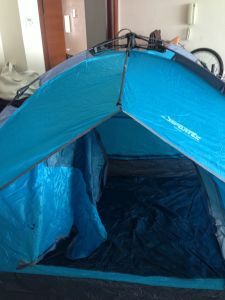 An auntie sells camping accessories & her tent only cost SGD24 but it was not waterproof. I know I don’t need a waterproof then but to be safe in case it will rain (you cannot predict nature), I need a waterproof. I only bought from her a sleeping bag for 15-25temp for only SGD18.00. NOTE: These stores don’t accept card or NETS. You only have to pay cash. The next day, I searched a tent and found one at qoo10.com. There are lots of tents to choose from. 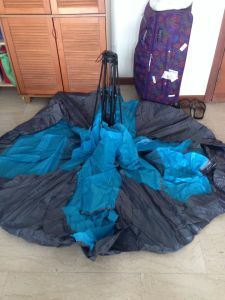 I choose from the “Aleyong” shop which is a blue waterproof sportext tent and it was SGD73+SGD6 for delivery. As per shop’s policy, it will be 3-5 days delivery. I bought at Tuesday evening and arrived at Saturday morning. It was a good buy because the tent was automatic and it was 3-4 man. Just pull the string on top and it will automatically locked and you are set to sleep. Imagine if I booked the cottage for 3 days. Let’s say I booked the cheapest one, which is SGD40 (standard with shared bathroom outside, the most expensive is SGD60 with own bathroom and facing the sea). So, SGD40 x 3 days = SGD120.00++ (10% service charge + 11% tax) = around SGD150 plus your food and daily activities. Okay, let’s compute again how much I saved after I check out, haha.